Mumbai-based dessert joint, IcecreamO opened its doors at Aundh last year. 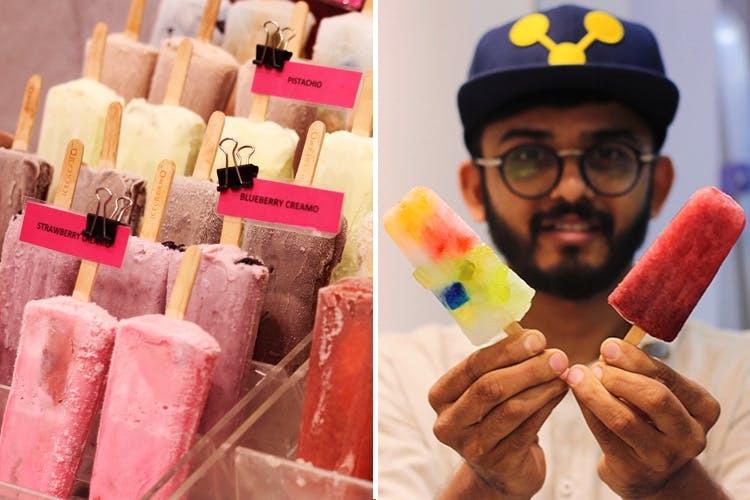 It is located near Westend Mall and is selling some frozen healthy popsicles sans preservatives, starting at INR 100. Known for multi-coloured popsicles and artisan desserts, IcecreamO serves 18 varieties of mighty frozen delights. However, the good news is, the desserts are guilt-free, sugar-free and has no added preservatives or emulsifiers whatsoever. The popsicles are made of fruits and honey sweeteners that you can truly taste with each bite. Love chocolate? say hi to the scrumptious brownie and oreo popsicles! Dip them in either dark or milk chocolate with almond, sparkles and choco toppings and you’re good to go. But the real show-stopper at IcecreamO is the Melodrama, a combination of plum, kiwi and orange topped with caramel corns and coloured sprinklers. If you want to experiment a bit, try their guava chilli, jellow mellow, watermelon basil and twister popsicles. These fresh fruit lollies come for INR 100. You can add choco dipping and toppings for an extra INR 40. Popsicles are love! And when they come with a health benefit at an affordable price, our happiness knows no bounds. Head to IcecreamO with the gang, and try ’em all today!